IT SURE IS NOT A 45 ACP 1911A1. WHAT IT IS, WHAT IT IS.... ASK ME? 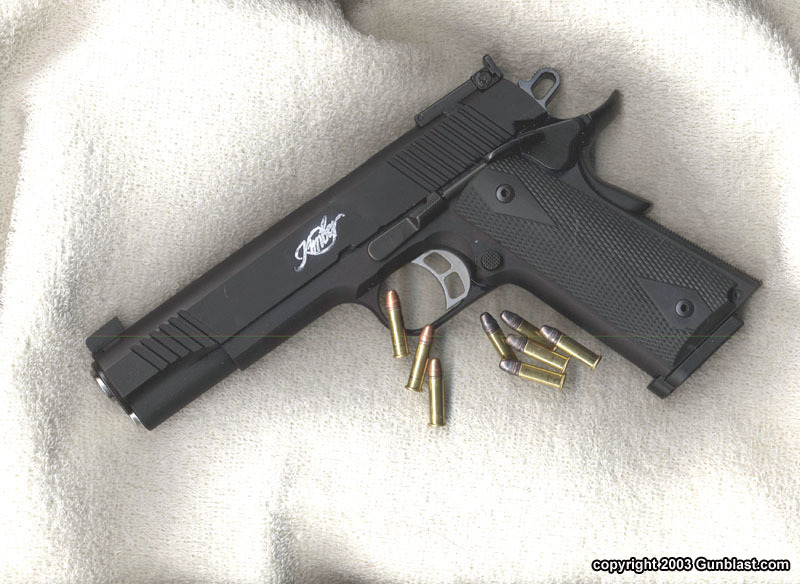 A Kimber 1911 A-22 Rimfire Target Pistol! When I lifted it from the box the first surprise was the weight. It wasn’t there. It’s an old habit: after carrying a 45 auto for 30 plus years of law enforcement, I expect 3 plus pounds of gun loaded. Instead it slipped into my hand so light, I lifted it higher than I intended. Yet it is the exact same size as a full 5-inch barreled 45 auto. But this one is not 45 caliber. It is 22 rimfire! Kimber has released the finest looking 45 framed 22RF I have seen in a long while. If you are like me, you have always thought about buying one of those add on slides and barrel to your 45 auto, that converts it to 22 rimfire. But again if you are like me, the cost has always put you off them. You can buy a good used gun at the prices of some of the conversion kits. Besides, who knows how they will fit and function? 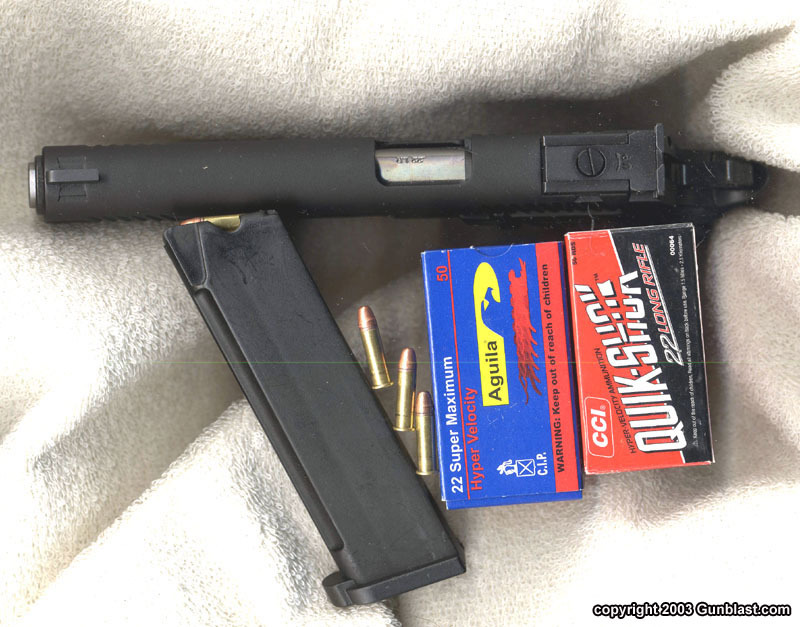 Kimber states in the manual that came in the fancy plastic box with the autoloader, that the slide and the frame are made of high strength aircraft aluminum. The hammer, palm safety, firing safety, magazine release, and the rest of the furniture is of steel. The barrel is a match 22RF barrel, and the trigger is a Kimber’s original adjustable type, used on target and custom guns. This is a Kimber all the way, from its target sights to its tight fit, from its oblong hollowed hammer to its classic neoprene grips, from its absolutely even cut frame and slide to its straight checker backstrap. It’s quality all the way. The target sights consist of an Ellison type adjustable unit cut into the back slide and a target straight front, that is cut into a dovetail for windage. And the whole package weighs an even 18 ounces loaded! The test gun was finished in a nice matte black anodized. There is also a two-toned offering with high visibility non-adjustable back sights on a silver slide, dovetailed for windage. I have close to 7000 rounds of various and sundry 22RF ammo on hand in my machine shop right now. Why so much? We make and test ACU’RZR and BABY SCORP'N tools, rifles and handguns, velocity from all kinds of firearms, pressure and much more. With all that .22 ammo on-hand, we really put the Kimber through its paces. It liked every different .22 load so well that I decided to try something a little different: I fired some "mix and match" magazines with high speed ammo from Federal, Remington, Winchester, Aquila, CCI, and PMC. 2 different types from Federal, Remington, and Winchester... 3 different types from CCI, one from Aquila and one from PMC. One round of each of these different makes and designs, all fired into the same bullseye at 20 yards, went into 1-½ inches! That’s 11 different rounds into 1-½ inches! That is unexpected performance, even from a Kimber handgun. It shot one of my favorite 22RF rounds, CCI’s Hi-Shok, with ten rounds into one and a quarter inches, still at 20 yards. Plus, this gun's 5" barrel milks the velocity out of the ammo the best it can, and the .221 - .222 bore offers a bit more resistance to the bullet which offers better velocity and consistency. My only nit-pick is that the Kimber ships with ONE TEN-ROUND CLIP. Come on Kimber, for $650 you can spring for two magazines per handgun! You can keep the fancy plastic case the gun comes in, I'd rather have an extra magazine. I don't recommend .22s for defense, but they certainly are better than a broken bottle. I have carried a .22 off and on for years; luckily, I've only had to use it on vermin, but a few well-designed high-velocity .22s would give an attacker a good deal of incentive to turn quickly and go elsewhere. Like a hospital, or the morgue if the shots are even close to being well-placed. Ask anyone who has slaughtered cattle or pigs with a .22 how effective they really are at close range. So, if you for whatever reason (recoil sensitivity, handicap, etc.) need to carry a .22 for defense, the Kimber would certainly be a fine choice. So now we don’t have to buy an expensive kit to convert our 45 autos to 22RF, or worry over fit and accuracy. We have the whole gun, at a bit pricey cost, but it is after all a top of the line... a Kimber. I really don't need another .22RF handgun, but this one is just too good to resist. At least I can knock that .22RF barrel and slide unit off my wish list. Of course, we will be on beans & tortillas for a month...mayhaps I will go get some "rabbitos" to add to the beans...and I will use the Kimber 1911 A22RF! 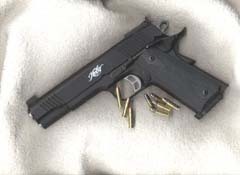 Check out Kimber's line of firearms on the Web at: www.kimberamerica.com. For near the price of a 1911 .22 conversion unit, Kimber offers the alternative of a whole new gun, and what a gun it is! As nice-looking as the Kimber .22 is, the proof is in the shooting; and folks, this gun can SHOOT! Paco tried the gun with a wide variety of ammunition and couldn't find ANY brand that did not shoot well in the Kimber. 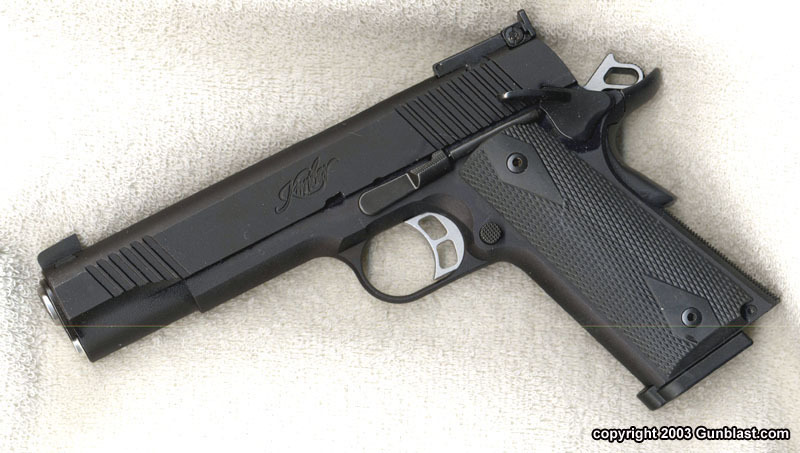 The Kimber .22 is no cheap sister to their .45 1911s. This is a precision machine capable of jaw-dropping accuracy, and it exudes the quality we have come to expect from Kimber.